The tufted titmouse is a small, gray bird weighing just under an ounce. Titmice are characterized by their gray backs, white underbellies, rust or peach-colored flanks, and a prominent tuft of feathers on the top of the head – making them easily recognizable. Their large black eyes and small, straight beak gives them a bit of a surprised look. However, their song can be quite loud and echoing. Titmice are especially vocal birds, with an ability to mimic the chickadee call, but typically have a loud peter-peter-peter song. They respond quickly to the agitated calls of other birds as well, and will assist in mobbing predators. In fact, they become exceptionally aggressive around predators and will often take the lead in mobbing activity. You can listen to examples of the tufted titmouse call song here. Although a little larger and slower than chickadees, the tufted titmouse is still an energetic and agile bird. 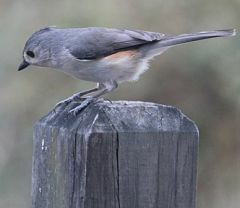 Their size gives them an assertive advantage over smaller birds at feeders where titmice can become very aggressive. Tufted titmice tend to be methodical at feeders, carefully plucking only one seed at a time to break apart with their sharp beaks or smack against tree branches. They are very active and often hang upside down to inspect pinecones, branches, and leaves for food. At feeders, they tend to prefer sunflower seeds and suet. Similarly to nuthatches, tufted titmice will also store seeds about 130 feet from feeders in tree bark and other nooks. Given the option, they will always pick the largest seeds out of a bunch and will shell the seeds before hoarding them away. During the summer months, insects make up the main diet of titmice. Caterpillars, wasps, stink bugs, and even spiders and snails are common titmice food. Two-thirds of their annual diet comes from insects, larvae, and eggs. Titmice also eat a variety of seeds, nuts, and berries, although these foods make up a significantly smaller portion of their diet. Tufted titmice live in the Eastern U.S. in deciduous and evergreen woodlands, often lower than 2,000 feet in elevation. They typically prefer dense canopies with many varying tree species, but are common backyard birds and can also be found in parks, orchards, and even urban spaces. The only variant in their population is the black-crested titmouse of Texas and Mexico, which differs slightly in song and genetic makeup. For a long time, these titmice were considered a subspecies of the tufted titmouse but were granted a separate species status in 2002. However, the two populations are able to interbreed and hybridize. This creates a narrow and stable hybrid population in a 30 to 60 mile stretch through Texas and Oklahoma. The hybridized birds are nearly impossible to distinguish by sight alone from other titmice. Tufted titmice tend to flock with other small birds like chickadees, nuthatches, and woodpeckers, especially during breeding season. Breeding titmice tend to stay together for a season or more in their designated territory. Because they can’t excavate their own holes, titmice nest in naturally constructed woodpecker holes. Deadwood is particularly important for titmice and over-clearing dead trees can impact their population. However, titmice have also been known to nest in nest boxes, fence posts, metal pipes, and many other man-made cubbyholes. Titmice usually spend between six and 11 days building their nests, which are typically 35 feet off of the ground but have been found as high as 90 feet. Scientists speculate that only the females participate in nest building, but it’s not yet clear. When constructing the outer, hardier part of the nest, female titmice use bark, moss, leaves, and thick grasses. For the inner portion, which will hold five to nine eggs, they use fur and hair pulled directly from living animals. Hair and fur from rabbits, raccoons, possums, squirrels, livestock, pets, and even humans have been found in titmice nests. The females then sit on and incubate the eggs for about two weeks before the eggs hatch into featherless baby birds. The female will stay with her young while her mate brings food to her, but both male and female titmice participate in feeding the newborn chicks. The young birds live in the nest until about 16 days after hatching. Occasionally, one of the juvenile titmice will stay with the parents throughout the breeding season and help raise more young. 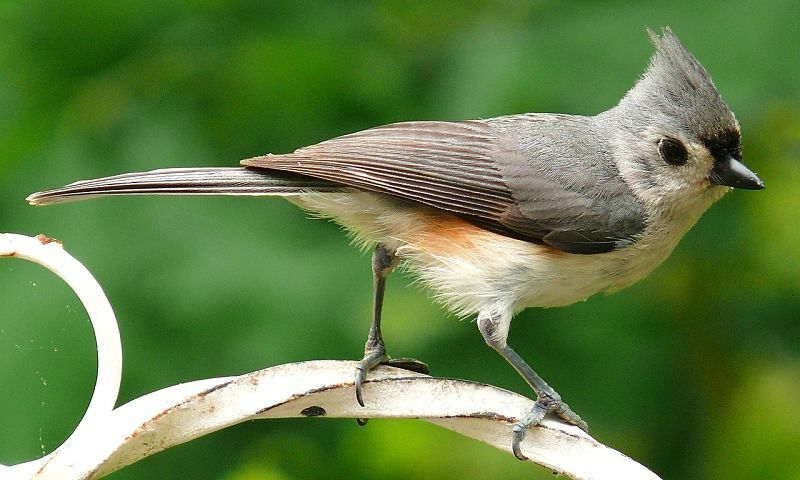 The average lifespan of the tufted titmouse is just over two years. However, the oldest known wild titmouse was at least 13 years old. It was banded in Virginia in 1962 and found again in 1974. Between 1996 and 2015, tufted titmouse populations increased dramatically. Estimates suggest around eight million breeding pairs, with the population almost entirely contained in the U.S. However, the species has slowly been expanding its territory northward over the last 50 years. Scientists aren’t certain why but speculate climate change, conversion of cleared farmland to forest, and an increase in backyard feeders to be the driving forces. The species now extends all the way through New England and into Canada, appearing as far north as New Brunswick and Quebec. Hey Buddy!, I found this information for you: "The Tufted Titmouse Bird". Here is the website link: http://backyardbirdingblog.com/the-tufted-titmouse/. Thank you.